LatentView Analytics provides its customers with actionable insights from digital data, which helps create brands, products and services that engage with consumers, across touch points. LatentView has won numerous awards recognizing its growth and expertise. Most recently, we were named 'Analytics Company of the Year - 2015'​ by Frost & Sullivan. We are also on the exclusive list of Advanced Consulting Partners to Amazon Web Services (AWS), validating our expertise and experience in Big Data Analytics. 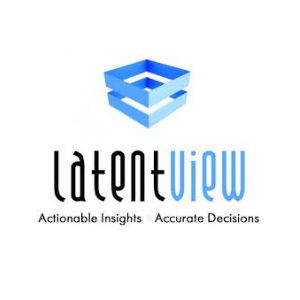 LatentView has also been named a 'cool vendor'​ in data analytics by Gartner. LatentView Analytics helps companies drive digital transformation through expert consulting services that combine digital and traditional data to provide a 360-degree view of the digital consumer. LatentView is in the business of enabling companies to predict new revenue streams, anticipate product trends and popularity, improve customer retention rates and optimize investment decisions.